Photo courtesy of Kimberly Blodgett. Well, I suppose a flower blooming in the toe is better than corn. @DnT: depends, if it is a sunflower, then it might be pretty painful. At least they didn’t spell elegant as elephant. So, who remembers the 60s band Blossom Toes? I make it a policy not to taste the charms of anything that grows on a toe. The excitement of a newly-wed bride a the mall? Blooming toes, they feel just like flowers! They left the apostrophe out of “Dio’s.” Wear the shoes in the dark and they’ll show a rainbow pattern. Foot Fetisism is mandatory in communist China. Dios shoes. But does it speak English? – Can I help you, Madam? 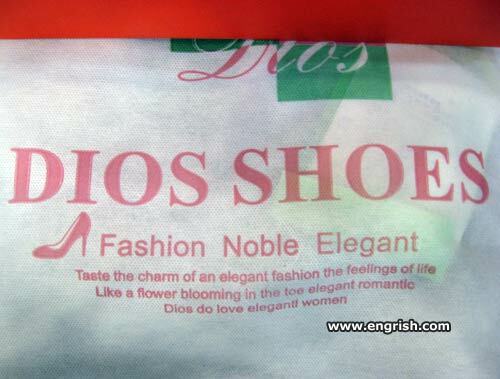 This ‘elegant fashion’ tastes like shoe leather to me. Was this what the Little Mermaid saw? And God said “let there be light pink satin pumps with four inch heels and a charming peep toe”, and there were light pink satin pumps with four inch heels and a charming peep toe. And lo. He could see pink shoes for miles. dios means loser in chinese..
Just be careful of the slime.. These belong to Dio Brando. Dios mio! What would Jesus buy? …And the three Wise Men came bearing gifts of incense, gold, and a pair of charming pink high heels.